Babblings of a Mommy: Emmy's 2010 Red Carpet Fashion. Emmy's 2010 Red Carpet Fashion. WELL--this year sucked didn't it?? I was a little let down with this year's fashion. I was waiting for that "WOW" moment that never came. As far as the actual show--I can't tell ya, cuz I don't watch them. They're always long and boring and the best part is always the red carpet anyway so who cares, right? Here are the ladies (and man) I think stood out of the bunch. Eva Longoria Parker in Robert Rodriguez. She looks great but I've seen this look on her before--long strapless back gown. *yawn* I wish she would have tried something different. Claire Danes in Armani Prive. This dress fits her like a glove! It's simple. It's classic. I wish she would have accessorized a little better but she still looks like a million bucks. Kyra Sedgwick in Monique Lhuiller. The dress is gorgeous but the hair is killing me! What was she thinking pairing that hair with that dress! Ugh. She's still one of the best dressed though. Hiedi Klum in Marchesa. Pretty, but waaaay too short. Forget a nip slip she's two seconds away from showing us ALL her goodies. Kim Kardashian in Marchesa. Pretty, but I've seen in her in THOUSANDS of white Grecian dresses. She needs to try something new. I'm over it. Jon Hamm in Giorgio Armani. 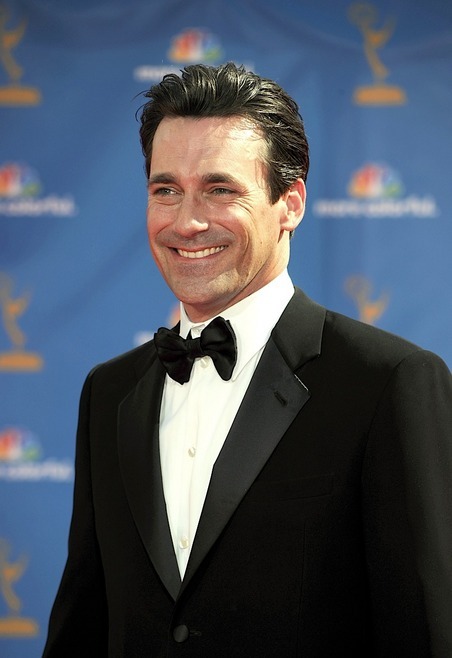 How dreamy is he in his sharply fitted tux? :) You can't get better than that ladies and gentleman. Tina Fey in Oscar de la Renta. Ummm..I didn't know Hieroglyphics were in this season?? Mindy Kaling in Aguri Sagimon. WTF?!? Ugh. the hair, the dress, what a total train wreck. Rose Bryne gets the award for best Bride of Frankenstein impersonation. Lo Bosworth. Let's forget the fact that she actually got invited. THIS is how you show up to the Emmy's?? So what do you think of my list. Do agree/disagree. Who were some of your picks. Let me know! That is definitely worst hair! My favorite was Lea Michele! I am all about her right now! !